The following programs are a combination of services provided by Butler County Recycling, local businesses and non-profits. County programs are available at no charge to Butler County residents. Businesses and contractors with commercial quantities of materials are advised to contact Butler County Recycling for additional recycling opportunities. Additionally, residents and businesses may also consult the search engine " What Do I Do About" at the bottom of our homepage for information on recycling outlets. Accepted items: Refrigerators, Freezers, Dehumidifiers and Air Conditioning units. Limit of 2 like appliances per pick up. Appliance MUST be placed in driveway or at curb on morning of scheduled pick up. Non-Freon appliances (washers, dryers, dishwashers, microwaves, stoves, water heaters, etc.) may be taken to a scrap metal dealer, such as Cohen for recycling. Please do NOT take hazardous wase items to our previous location drop-off on Cincinnati-Dayton Rd. ACCEPTED ITEMS: oil-based paint, antifreeze, gasoline/motor oil, pesticides/fertilizers, solvents/thinners, cleaners, household/auto batteries, fire extinguishers, propane tanks, mercury thermometers, fluorescent bulbs (all sizes), driveway sealer, thermostats and lawn/pool chemicals and more. For details contact 887-3653. 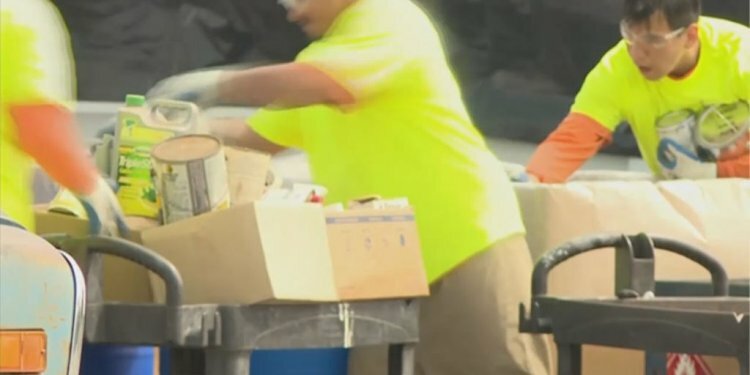 DO NOT BRING: Latex paint*, radioactive material, medical waste, explosives/ammunition, smoke detectors, tires, yard waste, electronics (computers/televisions), appliances, unmarked cylinders, fireworks/gun powder and prescription drugs. Did you know that you can. Accepted Items: computer towers, computer peripherals, fax machines, printers, copiers, laptops, cable/satellite boxes, DVR/DVD/Video players, microwaves, etc. no charge, monitors and televisions for a fee, call for details. Accepted Items: Computer towers, computer peripherals, fax machines, printers, copiers, laptops, phones, cable/satellite boxes, DVR/DVD/Video players microwaves, etc. at no charge, monitors and televisions for a fee, call for details. Fees apply for managing computer monitors, televisions of varying sizes and types. Please call ahead to verify fees. Hours: Mon - Fri: 9 a.m.-6 p.m./ Sat: 9 a.m.- 5 p.m. Accepted Items: All computers (working/non-working), computer monitors and computer peripherals. DO NOT bring televisions. Hours: Mon-Sat: 8 a.m.-8 p.m./Sun: 11 a.m.-5 p.m. Accepted Items: computers and monitors at no cost to residents. Accepted items: CPUs, computer monitors (flat screen only), computer peripherals, DVDs, VCRs, video game consoles, old stereo equipment, cell phones, cordless devices, etc. Hours: Mon: 8 a.m.-10 p.m./Tues-Fri: 10 a.m.-10 p.m./ Sat-Sun: 10 a.m.-7 p.m. Accepted Items: All CPUs, computers, monitors, computer peripherals, cell phones, DVD players, etc. Televisions (working/non-working) in the following sizes are accepted: traditional cathode ray tube televisions (up to 32 inches diagonally measured) and plasma and LCD televisions (up to 50 inches). FEE applies for TV and CRT recycling. 3 ITEM PER HOUSEHOLD PER DAY LIMIT. Area Staples stores accept outdated/unwanted computers and computer equipment for recycling at no charge. Televisions up to 32" (flat screen only). No tube TV's accepted. Contact your local Staples store for details. A licensed facility accepting universal wastes (fluorescent bulbs, batteries, etc.) and electronic wastes. NO syringes, lancets, liquids or inhalants. Walgreens - Middletown, 700 S. Breiel Blvd. Phone 513-425-8702. Middletown location only - see attached flyer. Visit for a full list of pharmaceutical collection points. WHEN: The County will offer this one day program again in Fall 2017. Take your used compact fluorescent bulbs to our Household Hazardous Waste drop-off site (see above for more information), or Clean Lites Recycling.